The best word to describe us is animal fanatics. We love all animals and if you should ask anyone who knows us, they will speak about the Zoo in town. We currently have 16 cats, 2 dogs, 2 horses and a teacup pig named Kevin Bacon. During the years we lost some of our pets, but will never be without them. We believe they are an extention of you as a person. Luan's Cattery is named after our son, Luan, knowing one day he will take over where we left off. He has grown with the expansion of our breeding program and is very much part of everything going in the cattery. We started our breeding program in 2007 when we imported our first Queen, Canicspots Vesper, and Stud, Charmed Cussler, from Canada. This was one of the main events in our lives! Since then we've learned so much and had ups and downs. Definitely more ups than downs! We are so proud of our Bengals and had some fantastic successes with the kittens that were born and which we kept for breeding purposes. All our studs have supreme championship status and although it is more difficult to show our Queens due to kittens, etc. they are all doing very well at the cat shows. All our cats were tested negative for Feline Aids and Feline Leukaemia. 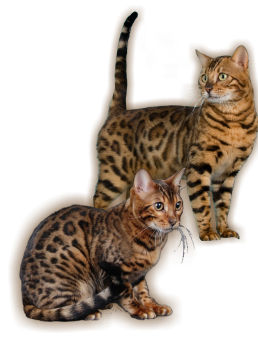 Our domestics were also all tested before we started with the breeding program and all our Bengals were tested when we received them from other breeders. We installed the Pet Persuader to keep our felines inside and other cats outside. They are not allowed to mingle with other cats. When it is time for the Queen to have her kittens, she will settle in in our bedroom and will have her kittens on our bed in a special cat carrier. We monitor her every 2 hours and will comfort her during the birth process and even bring her food and water to regain her strength during resting time between giving birth to the kittens. Mom and kittens will stay in our bedroom for up to weeks when they are moved to a play-pin for cats. This is where they are introduced to solid food and cat litter. At about 6 weeks old, they are introduced to the rest of our home, the outside world and our other pets. This is fun-time for everyone! We watch them for hours as they get use to all the new stuff in life. These moments are priceless. One of our main goals with this Breeding program is to change the way people think about Bengals. We still receive calls from people thinking that Bengals are aggressive and need to be kept outside in a cage. Unbelievable!. It is heart warming to give someone else the experience of a Bengal cat and get feedback about how the Bengal cat changed their lives. Our cattery has been planned and build with great care. Our Bengals are so valluable to us, and therefore it is so important that they are comfortable and safe at all times. We currently have 3 indoor/outdoor runs for the studs and 2 indoor/outdoor runs for the queens. During the long and cold winter months the panel heaters will be turned on throughout the season. Most of the times the Bengals will sit outside in the rain. They just love the water! Visits to our cattery are on appointment only.